Topps newest release, 2009 Topps T206, is a throwback issue that comes out during the 100th anniversary of the original vintage set. The original T206 is the most widely collected vintage set in the hobby. I know of numerous hobbyist who have put together 3 or 4 complete sets (minus the big 5 like Honus Wagner) throughout their lifetimes. It is just the gold standard set in the hobby. 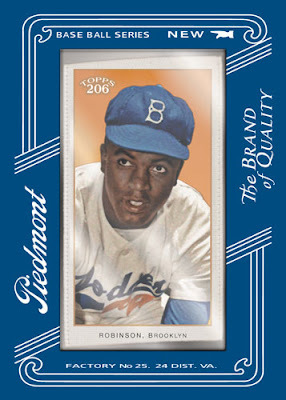 The Beckett blog recently released a sneak peak of the set that includes the above Jackie Robinson silk insert card. I just thought this card was worth sharing with all of you. Expect boxes to arrive in stores in November. In last night's game Vin Scully mentioned Babe Phelps. If I remember correctly the Dodgers had him catch a grapefruit from a tall building. 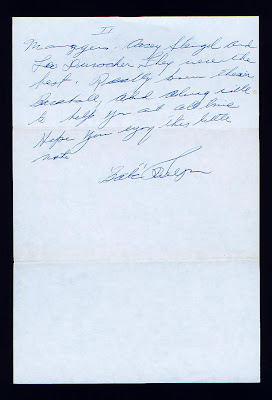 Anyway, below is a letter written by Babe to a fan. "The years that I played Baseball was very enjoyable and had some wonderful guys to play with. 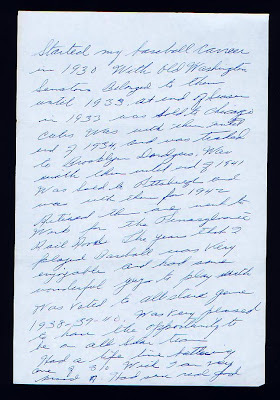 Was voted to (the) All Star game 1938-39-40. Was very pleased to have the opportunity to be a All Star team. Had a life time batting average of .310. Which I am very proud of. Had some real good managers- Casey Stengel and Leo Durocher. They were the best. Really knew their Baseball..."
BTW, he got his nickname "Babe" because of his resemblance to the Yankee slugger Babe Ruth. It is also worthy to note that he became fast friends with Ruth when he joined the Dodgers as a coach. Go to SABR's biography of Babe Phelps for a comprehensive history of his career. He was quite a character. Legacy Sports Rarities is about to close up on their recent summer auction of vintage Baseball cards, and their selection is really impressive. You should just do some window shopping to see what they have. Below are a few items that really stuck out to me. 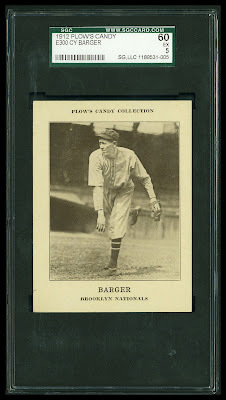 Unfortunately, there is not a lot of notable Dodger cards, but I did run across the below Plow's Candy card of Brooklyn Dodger Cy Barger that is worth noting. This set is a extremely rare and was only discovered in the late 1960's. In fact, it is not known how many cards complete a set and new additions are found from time to time. My Standard Catalog of Baseball Cards from 2002 list common cards in near mint condition at $2500.00 each. The 1887 Gypsy Queen is another set where a complete checklist is unknown. It is assumed that there are new additions yet to be found. 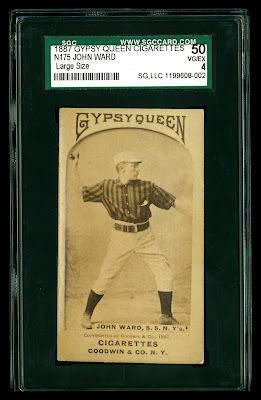 Below is Hall of Famer John Ward's Gypsy Queen large size card. It measure 2" X 3 1/2" and is much rarer than it's smaller brother (which measures 1 1/2" X 2 1/2"). With two days remaining it is already at $13,500.00. 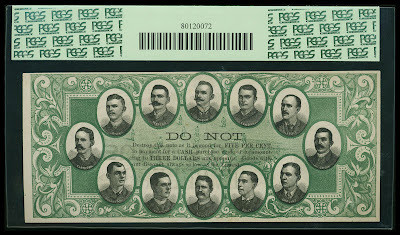 The 1887 Baseball Currency advertising pieces are some of the more ornate vintage collectibles in the hobby. They feature portraits of Major League teams and often have advertising printed on one side. They were probably handed out by store owners and used as coupons for future purchases. 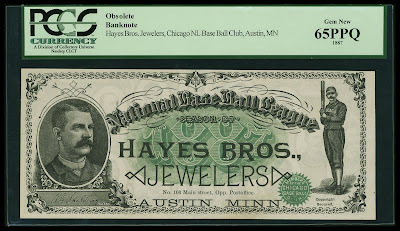 The below example offers a 5% discount to patrons at Hayes Brothers Jewelers. The bill below is of the Chicago White Stockings (White Sox) and features Hall of Famer Cap Anson in a familiar batting pose. It is graded by PCGS- a premier currency grader.